Commemorative or promotional French stamps first appeared in 1923, finally ending a 74 year onslaught of 184 definitive postage stamps. France actually did pretty well in coming up with their first commemorative stamp issue. As far as the first stamp issuing countries go, the United States had a two year head-start on France, and they had issued 229 definitive postage stamps, before issuing their first commemorative. Many of the European kingdoms did not issue any commemorative stamps at all, during their existence. The stamps shown above have that "definitive-letter-postage-stamp-series" look to them. THEY ARE, AND THEN THEY ARE NOT! 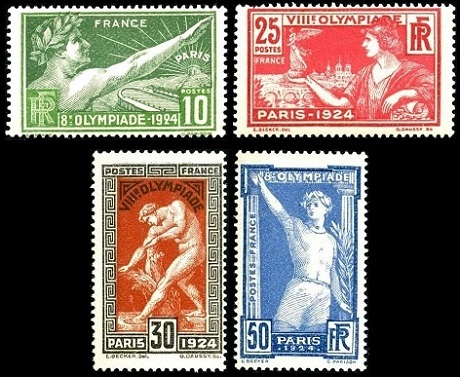 The twelve French stamps shown above (Y&T #170-81, Sc. #185-96) were issued between 1923 and 1926. 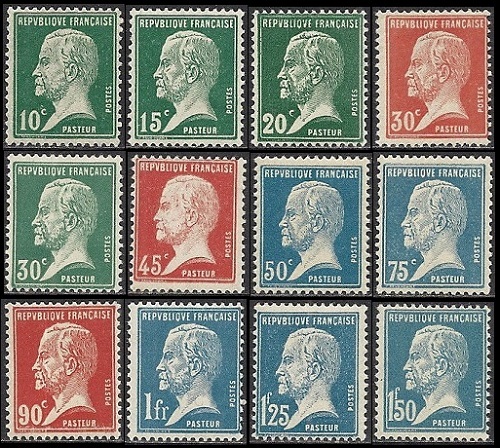 The 10 C., 30 C., and 50 C. denomination stamps were originally issued to commemorate the 100th Anniversary of the Birth of Louis Pasteur on December 27, 1822. The rest of the denominations were issued in 1924 and 1926. These stamps were very popular, and their use continued for some time as regular definitive postage stamps. Louis Pasteur (1822-1895) was a French chemist and microbiologist. He is famous for his breakthroughs in the causes and prevention of diseases. He is best known, though, for the invention of the process used for treating milk and wine to stop, often deadly, bacterial contamination. Today, we call this process "Pasteurization"! The Merson-Type 1 F. denomination definitive stamp shown above, at the left (Y&T #182, Sc. #197), was overprinted CONGRESS PHILATELIQUE / DE / BORDEAUX / 1923 on June 15, 1923, to promote the International Philatelic Congress. The 75 C. denomination stamp shown above, at the right (Y&T #209, Sc. #219), was issued on October 6, 1924. It commemorates 400th Anniversary of the Birth of Pierre de Ronsard (1524-1585), a medieval French poet. During his lifetime, he was called the "Prince of Poets" by his contemporaries. 10 C. - Allegory of the Olympic Games. 25 C. - The Olympic Trophy. 30 C. - Milo of Crotona. 40 C. - Victorious Athlete. The Olympic Motto, "Citius, Altius, Fortius" (Faster, Higher, Stronger) was used for the first time. These were the first Olympic Games to feature an "Olympic Village". In gymnastics, 24 athletes scored a "perfect 10". Johnny Weissmuller won three gold medals in swimming and a bronze medal in water polo. He later went on to play the character "Tarzan" in the movies and on television. Ireland competed, for the first time, as an independent nation at these Olympic Games. The set of six stamps shown above (Y&T #210-15, Sc. #220-25) were issued during 1924 and 1925 to promote the upcoming International Exposition of Modern Industrial and Decorative Arts. The exposition was held from April to October 1925 in Paris. The term "Art Deco" originated at this exposition, being a contraction of the French words for the exhibition, "Arts Décoratifs". Allegory of "Light and Liberty". Majolica Vase, with Lettering Describing the Exhibition. The massive souvenir sheet shown above (Y&T #216 (Bloc #1), Sc. #226, #226b) was issued May 2, 1925 for the International Postage Stamp Exhibition. The actual size of the sheet is 140 mm x 220 mm. 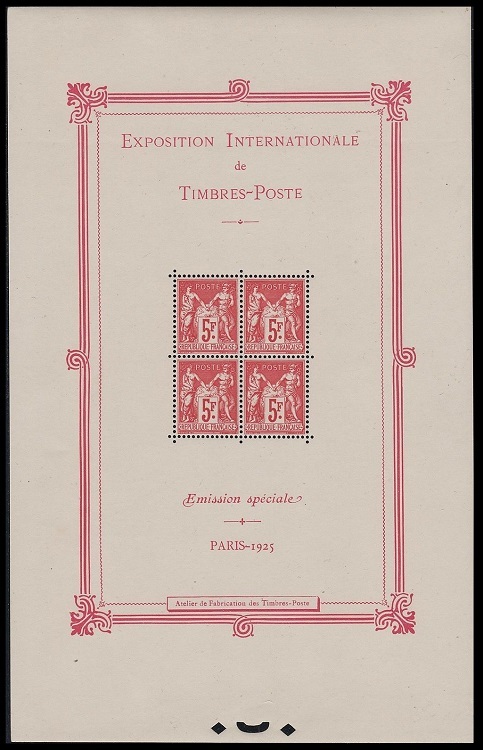 The exposition was held in Paris, during May 1925, and these souvenir sheets were only made available for purchase at the exhibition, which would surely account for their rarity today. The central feature of the sheet is a 5 Fr. denomination block of four of the Sage Type definitives, printed in Carmine. 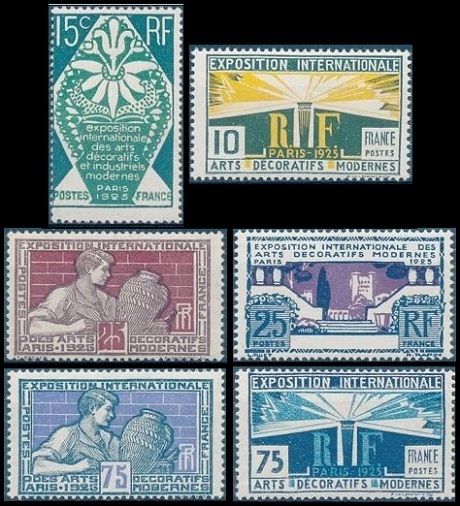 Of course, everyone that collects the Sage Type French stamps needs one of these 5 Fr. stamps for their set. As a result, many of these 5 Fr. stamps were removed from the souvenir sheets and saved as single stamps. Some of them were actually used for letter postage! The single stamps that have been separated from the souvenir sheets are actually pretty common.